Patulous Eustachian tube is a specific type of inner ear disorder in which the Eustachian tube intermittently opens when it should be closed. As a result of Eustachian tube opening, individuals with this condition may report a variety of unpleasant symptoms. Among the most common of all symptoms associated with Patulous Eustachian tube is that of autophony – the amplification of self-generated sounds such as: breathing, speech, and heartbeats. In addition to autophony, you might notice crackling sounds within your ears, tinnitus (ringing of the ears), and/or ear pain (e.g. an uncomfortable suction-like sensation). What causes Patulous Eustachian tube? Have you ever experienced Patulous Eustachian tube? Included below is a list of symptoms associated with Patulous Eustachian tube. Understand that if you have this condition, you’re not necessarily going to experience every single symptom on this list. Moreover, the severity of the symptoms that you experience may differ from that of another person with this same condition. It is also likely that some people will experience additional symptoms associated with Patulous Eustachian tube that are not documented in this article. Autophony: If you have this condition, you’ll likely experience autophony in one or both ears. Autophony means that you’re hearing internal bodily sounds such as your own breathing, speaking, and/or heartbeats. These internal sounds may be particularly loud, whereas external sounds such as from your environment may be significantly muffled and/or silent. If you have autophony, you’ll probably only be capable of hearing sounds from within your body. Crackling sounds: Sometimes you might notice that one ear or both ears generate crackling sounds. Crackling sounds may occur intermittently and/or for an extended duration prior to, during, and/or after your bout of Patulous Eustachian tube. The crackling is usually very easy to perceive and reportedly sounds like Rice Crispy cereal after you pour in the milk – snap, crackle, pop. Some may actually describe the crackle as a “snapping” or “popping” within the ear canal. Depression: Someone dealing with a chronic case of Patulous Eustachian tube may experience severe depression due to incessant disconcerting symptoms. In fact, the depression may be so severe that the patient becomes suicidal. Psychotherapeutic interventions may be helpful, but usually the depression abates when the Patulous Eustachian tube is fixed – such as after surgery. Dizziness: It’s common to experience dizziness, vertigo, and lightheadedness with Patulous Eustachian tube. Your inner ear is what gives you a sense of balance, and when its plugged up, you may feel extremely dizzy or experience a spinning sensation. When this occurs, some individuals get relief from lying down on the ground. Ear discomfort: Many people with Patulous Eustachian tube will report discomfort, and in some cases, severe pain. The intensity of discomfort or pain is probably a byproduct of individual anatomy and the degree to which the Eustachian tube is open. Nonetheless, the discomfort may be described as an unpleasant vacuum-like or suction-like sensation. 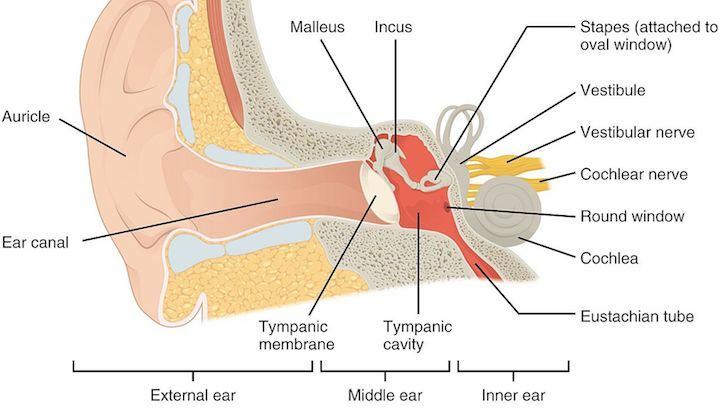 Hearing loss: While hearing loss from Patulous Eustachian tube can occur, it’s usually transient such that normal hearing returns when the problematic open Eustachian tube manages to close. Nevertheless, while the Eustachian tube is open, many people exhibit reductions in the ability to perceive external sounds – they may sound muted, muffled, or barely audible. Panic: While experiencing Patulous Eustachian tube, especially for the first time, it’s common to panic. Because you don’t know what’s happening in your body, you may freak out thinking that your ear is damaged and/or that your ears will never normalize. The anxiety and panic can cause heart palpitations, which can sound like a loud bass drum thumping due to autophony. In my experience, the longer Patulous Eustachian tube lasts, the more extreme the anxiety/panic. That said, if you know what you’re experiencing is 100% Patulous Eustachian tube, and you’ve recovered from it before, you’ll probably be less likely to panic – you know what you’re dealing with. Plugged sensation: Most people will report that a single ear or both ears are suddenly plugged. The plugged sensation is a result of the open Eustachian tube whereby autophony occurs. It’s almost as though your ear is plugged deep within whereby the plug is preventing it from perceiving external sounds and limiting it to an internal echo chamber. Tinnitus: Another common symptom associated with Patulous Eustachian tube is tinnitus or ringing of the ears. The tinnitus may occur intermittently or may be nonstop while your Eustachian tube remains open. For most, the tinnitus subsides and/or lessens as soon as the Eustachian tube is closed. Note: The symptoms of Patulous Eustachian tube may occur in a single ear (unilaterally) or both ears (bilaterally). In addition, it is possible that symptoms may vary between ears or switch ears with different episodes. Lastly, if you’ve never been formally diagnosed with Patulous Eustachian tube, do NOT attempt to self-diagnose with this article. Always consult a medical doctor, preferably an ENT, to rule out other conditions that may yield similar symptoms. The causes of Patulous Eustachian tube will be subject to significant individual variation. Many individuals develop the condition after rapid weight loss such as following bariatric surgery. Others may have been born with anatomical abnormalities of the Eustachian tube or inner ear such that, during intense exercise or heavy breathing, episodes of Patulous Eustachian tube occur. Additional hypothesized causes of Patulous Eustachian tube include: autoimmune conditions, hormone levels, and pregnancy. Anatomical abnormalities: Although probably rare, it’s possible that a subset of individuals were born with anatomical abnormalities of the Eustachian tube and/or inner ear. If these abnormalities are present from birth, they may cause lifelong symptoms without intervention of a medical expert. Additionally, a subset of individuals with atypical inner ear anatomies may not experience ongoing Patulous Eustachian tube, however, these persons may be particularly sensitive to triggers of the condition such as dehydration, intense physical exercise, and weight loss – whereby these triggers induce intermittent episodes of Eustachian tube dysfunction. Dehydration: Dehydration as a standalone factor is unlikely to cause Patulous Eustachian tube. That said, persons who are at risk of developing the condition such as from anatomical abnormalities, weight loss, autoimmune conditions, etc. – may be highly susceptible to Eustachian tube dysfunction as a result of dehydration. Intense physical exercise and use of stimulants are associated with dehydration and may explain why these are also triggers for Patulous Eustachian tube. Exercise: Any type of intense exercise can trigger Patulous Eustachian tube in vulnerable populations. Exercise could induce Eustachian tube dysfunction in numerous ways including: altered breathing (such as while sprinting or lifting heavy weights), dehydration, and/or general movement (perhaps this could shake things up within the inner ear). Some individuals who lift heavy weights such as in powerlifting have reported transient bouts of Eustachian tube dysfunction. Others notice that Eustachian tube dysfunction occurs during or after aerobic exercise such as while jogging, jumping rope, or sprinting. Hormone levels: Some researchers believe that abnormalities in hormone levels may lead to the onset of Patulous Eustachian tube. Evidence indicates that fluctuations of estrogen and progesterone may increase interstitial fluids within the middle ear. These interstitial fluids may cause the Eustachian tube to remain open when it should be closed, thereby causing Patulous Eustachian tube and symptoms such as elevated middle ear pressure and decreased auditory sensitivity. Drugs: Various medications (pharmaceutical and over-the-counter) and illicit drugs may cause intermittent bouts of Patulous Eustachian tube. It’s fair to suspect that stimulants might cause this condition due to their dehydrating effect and influence upon hormone levels. It is also known that certain drugs like atropine and amantadine can sometimes directly impair the ability of the Eustachian tube to open, ultimately causing Patulous Eustachian tube. Select dietary supplements may also cause Patulous Eustachian tube. Medical conditions: Research supports the idea that certain autoimmune conditions can cause Patulous Eustachian tube. The autoimmune condition that’s most associated with Patulous Eustachian tube is granulomatosis with polyangiitis (also known as Wegener’s granulomatosis). Though unclear as to why this autoimmune condition triggers Patulous Eustachian tube, some researchers have suggested that the Eustachian tube is directly affected by the condition such that scarring may occur. Other inflammatory and otolaryngological conditions may also induce Patulous Eustachian tube. Pregnancy: It is documented in medical literature that pregnancy can cause Patulous Eustachian tube due to alterations in levels of hormones. The hormone alterations in pregnancy increase surface tension and mucus within the respiratory system whereby the Eustachian tube may fail to properly close. Research indicates that factors such as: serum estriol (E3) levels, longer gestation, estrogen production, and weight gain during pregnancy – increase odds of pregnancy-related Patulous Eustachian tube. Surgery: Anyone who’s ever had ear surgery or nasal surgery may end up with Patulous Eustachian tube as a complication or protracted effect of the procedure. In some cases it may remit during the healing phase of surgery, whereas in other cases, it may remain as a permanent unwanted complication. Weight loss: Losing weight, especially rapidly, is known to cause Patulous Eustachian tube in a subset of persons. Many people develop Patulous Eustachian tube after bariatric surgery and chemotherapy due to the sudden weight loss. When a person loses weight quickly, fatty padding around the Eustachain tube (known as Ostmann’s fat pad) shrinks and the Eustachian tube loses necessary support from the pad for efficient tube closure. Due to lack of fatty support, the Eustachian tube stays open and Patulous Eustachian tube presents. It’s unclear as to why this pad shrinks and/or becomes a problem for some people after weight loss and not others. Perhaps hormonal changes and/or suboptimal nutrition during weight loss (e.g. low dietary fat, micronutrient deficits, etc.) may play a role in weight loss-related Patulous Eustachian tube. (Read more: “Weight Loss & Eustachian Tube Dysfunction“). Treatment for Patulous Eustachian tube depends primarily on the underlying cause. Only a medical professional, particularly an otolaryngologist (ENT), is qualified to determine potential causes and recommend treatments. For this reason, if you’re experiencing Patulous Eustachian tube, it’s always best to work with your doctor to manage and/or correct the condition. Included below is a list of therapeutic interventions that may help control or fix Patulous Eustachian tube. Medication: A medical doctor may prescribe medications that are designed to induce congestion within the Eustachian tube orifice within the nasopharynx. The whole purpose of medication-induced congestion is to promote closure of the Eustachian tube. Estrogen + saline (Premarin): The combination of estrogen/saline nasal drops may prove useful in the management of Patulous Eustachian tube and is the most common first-line intervention. This combination can be made by a compounding pharmacy and will typically include 25 mg conjugated estrogens in 30 mL saline. Most patients will be instructed to administer this concoction 2-3 times per day. Benzyl alcohol, chlorobutanol, diluted hydrochloric acid: If Premarin nasal drops are unable to correct the Patulous Eustachian tube, other nasal medications containing benzyl alcohol, chlorobutanol, and diluted hydrochloric acid may prove therapeutically useful. That said, these are not approved by the FDA for the management of Patulous Eustachian tube. Weight (re)gain: If your Patulous Eustachian tube was deemed attributable to rapid or substantial weight loss, your doctor may recommend weight regain as a treatment. Regaining bodyweight can be accomplished by consuming more calories than your body expends throughout the day. If you have trouble gaining weight, it is recommended to track calories to ensure that you’re hitting a specific number per day to increase body weight. Some people may not need to gain as much weight as others for normalization of the Eustachian tube. These interventions haven’t been well-researched, however, there’s reason to suspect that they might help some individuals when used in conjunction with first-line therapies. For most, these possibly-useful interventions are worth trying before pursuing surgery. Hydration: It is known that dehydration can serve as a trigger for Patulous Eustachian tube. Some individuals may benefit from increasing their daily water intake. Keep yourself hydrated throughout the day by sipping water – but don’t go overboard. Stress reduction: It is thought that high stress and/or anxiety may also trigger Patulous Eustachian tube. For this reason, it is smart to do whatever necessary to keep your stress low. This may mean meditation, paced breathing, hopping in a sauna, getting more sleep, and/or cutting out caffeine. If none of these options help, talk to your doctor about using anxiolytic supplements or medications. Modest exercise: It is good to stay physically active with light exercise such as walking. That said, it is recommended to abstain from intense cardio and/or heavy weightlifting – as each may trigger Eustachian tube dysfunction. Nutritional corrections: Though never investigated, it’s fair to suspect that deficits in specific macronutrients (particularly fats) and micronutrients may lead to onset of Patulous Eustachian tube – especially in cases of weight loss. If you’re eating a low fat diet, you may want to eat higher fat for the sake of hormone production and storage (within your ear). The easiest way to hit all of your micronutrient requirements is via supplementation with a good multivitamin. Avoid stimulants: Not only do stimulants increase stress and cause dehydration, but they may directly trigger Patulous Eustachian tube. Try cutting out all stimulants from your life for a few weeks and reevaluate the severity of your condition. Avoid extreme temperatures: Temperature extremes of hot and cold may contribute to Patulous Eustachian tube. In addition to extreme temperatures, some anecdotes report that high humidity seems to be a trigger. If you’re living in extreme environments (e.g. hot or cold) it may help to avoid physically overexerting yourself in such conditions. Avoid extreme altitudes: Altitude changes such as from flying, mountain climbing, and/or deep-sea diving may aggravate the Eustachian tubes. If you have Patulous Eustachian tube, avoid shifting altitudes at all costs until you get things corrected. Mindful nose-blowing: If you need to blow your nose, don’t blow forcefully as this may cause pain and/or trigger Patulous Eustachian tube. Be mindful of when you need to blow your nose and only blow very lightly if you have a cold. Alter head positioning: While experiencing Patulous Eustachian tube, some find that lying their head down helps. The rationale behind lying the head down has to do with the fact that venous blood pressure and mucosal congestion increase whereby the Eustachian tube might shift from open to closed. Anecdotes also claim that tilting the head foreword between one’s knees while standing may help, as well as lying down with feet elevated at least 20 inches off the ground – especially when used every day for several weeks. In patients with chronic Patulous Eustachian tube who either are: unable to follow first-line therapies (e.g. can’t gain weight) or don’t respond to first-line therapies (e.g. weight gain doesn’t help), more invasive treatments are available. The most common second-line therapy for Patulous Eustachian tube is surgery. Various types of surgeries can be performed to induce closure of persistently open tubes. Tympanostomy tube: A surgical procedure can be performed in which a small tube is implanted within the eardrum. The function of this tube is to maintain aeration within the middle ear for a prolonged duration and to prevent fluid accumulation within the middle ear. Of all patients who receive a tympanostomy tube implant, approximately 50% get relief from Patulous Eustachian tube. Injections: Some individuals with Patulous Eustachian tube may benefit from the injection of materials surrounding the Eustachian tube. These materials are biocompatible and can provide temporary or long-term relief. Usually a surgeon will first test out temporary injectables, and if good relief is attained by a patient, a permanent or long-term injectable will be used thereafter. Various types of soft-tissue bulking agents such as: gel foams, fats, and cartilage may be used for injection therapies. Eustachian tube closure: In certain cases, surgeons may opt to close the Eustachian tube with the combination of a cartilage graft at the nasopharyngeal orifice, cautery and sutures. Some patients may benefit from a multilayer surgery in which a combination of cautery, fat plugging, and suture ligation are utilized. In summary, Patulous Eustachian tube is well-understood but chronic cases may not respond to medical or surgical interventions. That said, surgical interventions seem to be safe treatment modalities with moderately successful outcomes. More research is needed to determine the safest surgical interventions (no comparative analysis has been conducted), and surgical innovation is needed to increase likelihood of surgical success with minimal side effects. My first episode of Patulous Eustachian tube occurred in winter 2017 – on a very cold night (below 0 degrees Fahrenheit). I was extremely stressed from a combination of working long hours, not getting enough quality sleep, cutting calories, trying to find a new apartment, and the holiday season. In addition to the aforementioned stressors, I was over-exerting myself physically by lifting weights and doing high-intensity interval training. About 45 minutes into a late-night walk, the hearing ability of my right ear suddenly transitioned from being perfectly clear to fully plugged. This ear could only perceive internal sounds such as my breathing (which sounded very loud) and my heart beat (which was palpitating in a state of panic) thumping like a subwoofer. It felt as though someone had shoved a suction cup and/or plunger within my left ear canal. In addition to this suction-like sensation, I experienced acute tinnitus or ringing in the affected ear. My left ear remained normal and could hear external sounds just fine – with no amplification of self-generated sounds. I should note that, immediately prior to experiencing the suction-like sensation within my ear, I noticed a bit of “crackling” and “popping” – similar to what you’d hear after pouring milk into Rice Krispy cereal. Though I hadn’t ever experienced such crackling sounds before, I figured they were attributable to the viral infection that I fought off earlier in the month. Nevertheless, at the exact moment when my first episode of Patulous Eustachian tube occurred, it drove me into a state of panic – leading me to fear that I had experienced sudden sensorineural hearing loss (SSHL) as a result of the virus passed on from relatives that were insensitive enough to attend a Christmas gathering sick (without notifying anyone until after the fact). In any regard, back to the episode of Patulous Eustachian tube. Just prior to the episode I had been doing “snot rockets” to clear my sinuses. Additionally, I had been walking in very cold weather with wicked wind chill for a reasonable duration. Because I was wearing a poorly-crafted winter hat and never used a hood, the wind penetrated the fabric of my hat and infiltrated my ear canals – causing them to be cold. I’m not sure whether the extreme weather conditions contributed to the Patulous Eustachian tube, but I know that the snot rockets could’ve been a major contributor. That said, I had been snot-rocketing all winter – and most of my life – with zero prior episodes of Eustachian tube dysfunction. For this reason, I feared that my “episode” was really sudden sensorineural hearing loss (SSNHL) and completely panicked – fearing the worst for my ears. I jumped up and down praying that the suction-like sensation would abate and that my hearing would be restored to normal – but it never normalized during the remainder of my walk. When I arrived home at around 10 PM, I debated as to whether I should go to the emergency room for immediate medical care. If sudden sensorineural hearing loss, the best intervention may be immediate corticosteroid administration. Even at home I freaked out, was yelling, jumping up and down, performing the Valsalva maneuver, etc. As an at-home intervention, I also immediately administered high doses of Vitamins A, C, E, plus magnesium – as this cocktail is supposedly otoprotective whereby it decreases oxidative stress to preserve cilia (hair cells). Though the magnesium helped my panic attack, I also had to do some breathing exercises to fall asleep. The next morning my hearing seemed relatively normal – for which I was extremely thankful. Heck, I was practically suicidal due to the discomfort and unilateral hearing loss… was driving me bananas. I debated talking to a medical doctor about my issue and/or scheduling an appointment with an ENT, but things had normalized and I didn’t want to spend money. Upon researching my issue, I used Google and PubMed to determine whether factors such as: a viral infection, stress, cold weather, and/or weight loss could’ve caused the symptoms I was experiencing. Although I was convinced that my symptoms were related to the aftermath of a viral infection, I had fully recovered from the virus for at least several weeks (with no symptoms) prior to this episode. Nevertheless, I suspected that there could be some sort of protracted or residual viral or immune effects that were influencing my ears. My initial search results increased my confidence in thinking that what I had experienced was related to the virus that my immune system recently fought. Nevertheless, I somehow ended up searching for Eustachian tube dysfunction (something that I considered a viable possibility) and weight loss. This led me down the rabbit hole of many types of Eustachian tube dysfunction, but only one diagnosis that fit the billing: Patulous Eustachian tube. Numerous episodes of Patulous Eustachian tube were documented in medical literature among individuals who had lost weight rapidly – such as from bariatric surgery. Before this episode I was on a weight loss streak – I had lost 15 pounds in a fairly short duration through a combination of decreasing caloric intake and increasing energy expenditure. Because my symptoms perfectly matched those associated with Patulous Eustachian tube, and I had lost a reasonable amount of weight (one of the chief causes) – I intuitively knew (i.e. had an “aha moment”) that this was the correct diagnosis. I would later confirm my self-diagnosis with an actual medical doctor who concurred. After my first severe episode, I realized that I had actually experienced the condition once before – in the aftermath of a 7-day water fast that I had done 2 months earlier. That said, after my first severe episode of Patulous Eustachian tube, I would experience it a few more times – usually when I was: tweaking my body weight (via a caloric deficit), exercising hard (lifting or cardio), using caffeine, and/or highly stressed. Thankfully I’ve figured out how to keep Patulous Eustachian tube at bay for me – my strategies may not work for you. What works best for me includes: maintaining a bodyweight above 170 lbs., eating enough dietary fat (episodes occurred most when on a lower fat diet), staying hydrated, cutting caffeine, and reducing stress. I believe that, in my case, body weight (or fat) is the single most important trigger for Patulous Eustachian tube – followed by high dietary fat intake and a multivitamin (in case micronutrients play a role). Moreover, I’m less likely to experience Patulous Eustachian tube if I lose weight slowly than if I lose weight rapidly. If you’ve ever experienced Patulous Eustachian tube, share your experience in the comments section below. Report what caused the condition for you – what you think and/or your doctor suspects. Also some strategies that you’ve found successful for managing and/or fixing it. Have you tried any of the therapeutic interventions that I discussed in this article? Have you had any kind of surgical intervention to fix it? Document any additional information regarding Patulous Eustachian tube that you think will be interesting, useful and/or valuable for others to read about. Hello Drew, was nice to read your story after researching the net for answers. I too have self-diagnosed PET and am awaiting my referral to an ENT for a positive diagnosis and rule out otherwise. I also have a condition called SCDS, as demonstrated on a HR-CT scan. A tiny hole in my ear canal that causing many of the symptoms of PET. especially AUTOPHONY! which in my opinion is the worst to live with. Anyway, my patulous eustachian seems to be intermittent and if there’s a way to manage the condition I believe I can learn to cope. Wow, thank you so much for this article. So helpful and informative. It has brought me peace. This is exactly me. I have experienced many of the symptoms and causes described here and had my diagnosis confirmed about 2 weeks ago by an ENT and audiologist. My Eustachian tubes were visually “wide open” and my ear drum flutters when I talk from the air coming inside my middle ear space from my open Eustachian tube. It’s extremely annoying and I have to talk soft to avoid the constant ear drum flutters and popping/crackle. It even flutters and pops when I hear certain high pitched/loud noises. I also have tinnitus, it gets loud and soft but it is CONSTANT. A high pitched hissing/ringing kind of tinnitus. It’s enough to make anyone go crazy. I have sensitivity to sounds, ear fullness, headaches, and I can hear my heart beat and breathing. It also feels that when I talk I can hear my voice vibrating my whole head. This all seems to be triggered by stress, weight loss, and hormones for me. The beginning of my monthly cycle is when it’s the worst. I’ve also been at my thinnest the last 6 months and the most stressed I’ve ever been. I am going through a lot of crud in my life! I have been going CRAZY for two months now with this problem. I have been panicking, crying, suicidal, depressed, anxious, and beyond scared that this is my new life. It’s horrible. Reading this brought me hope and peace that I can treat it and get the symptoms to subside. I am currently trying estrogen nasal spray and saline nasal rinse. I am also trying to gain about 5-10 pounds. Would you please let me know how long your symptoms lasted? Is your hearing back to normal and tinnitus improved? What helped you the very most? Thank you so much! Hi Jess, may I first say how sorry I am that you like many others have to live like this. I too am seeking answers and help, if there is any, to live with this maddening condition! Note: The author of this site is not engaged in rendering professional advice or services to the individual reader. The ideas, procedures, and suggestions contained within this work are not intended as a substitute for professional advice. I shall not be liable or responsible for any loss or damage allegedly arising from any information or suggestions within this website.